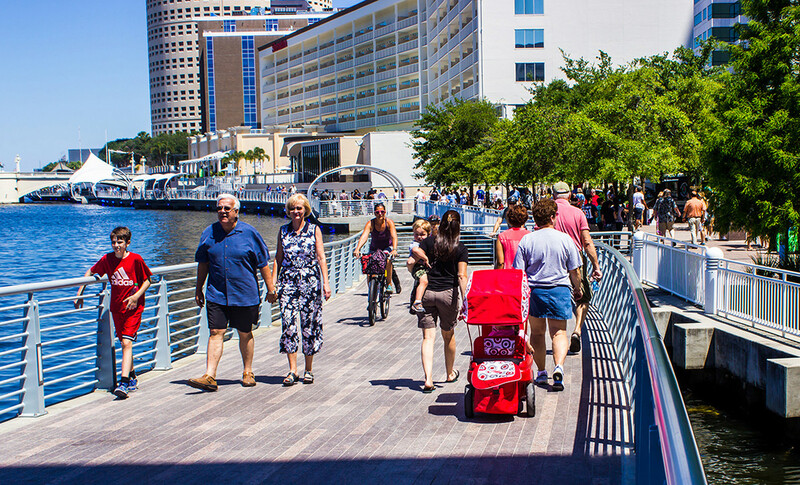 The Riverwalk at Kennedy Boulevard Plaza is the central and vital link of the Tampa Riverwalk. 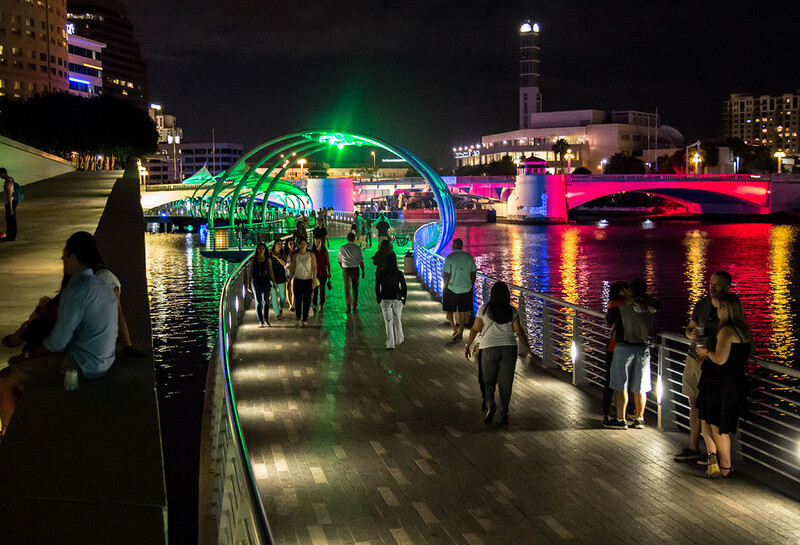 The opening of this segment of the Riverwalk, connecting almost 2.5 miles of a continuous waterfront amenity, infused the City with activity and patronage of many residents whom had never previously experienced downtown. 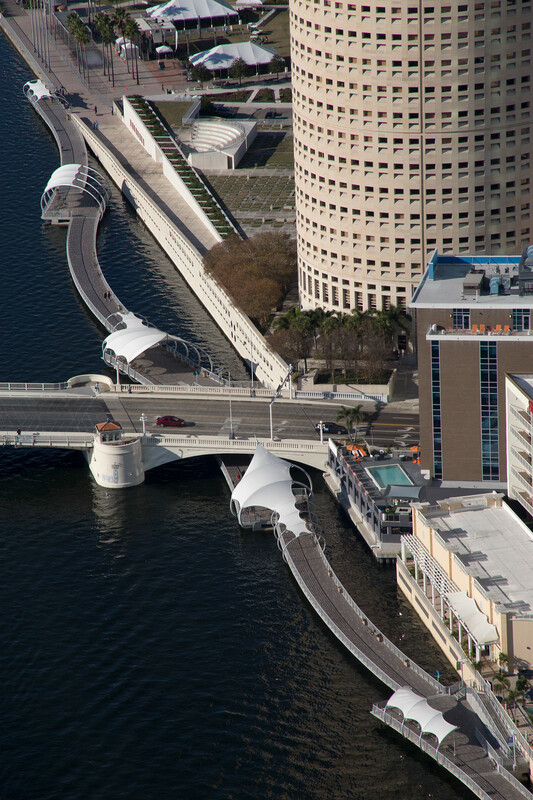 At over a third of a mile, the Kennedy Boulevard Plaza is the longest and the only over-water segment, and considered to be the crown jewel of the Tampa Riverwalk. 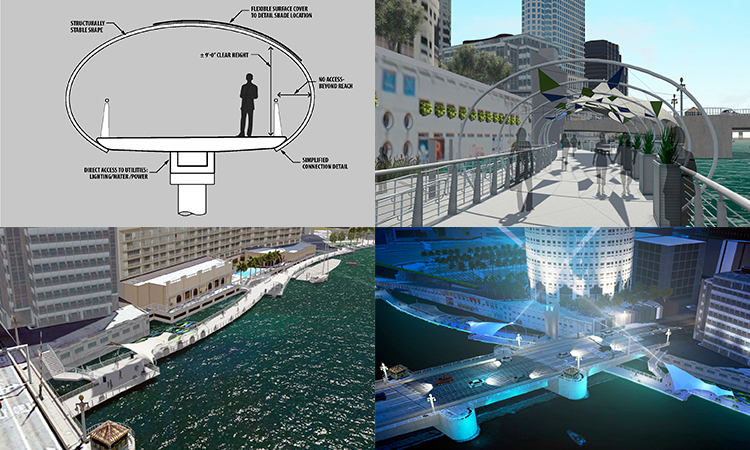 Completion of this segment of the Riverwalk connects MacDill Park to Curtis Hixon Waterfront Park under the Historic Kennedy Boulevard Bridge, the major corridor to the urban center of downtown Tampa. 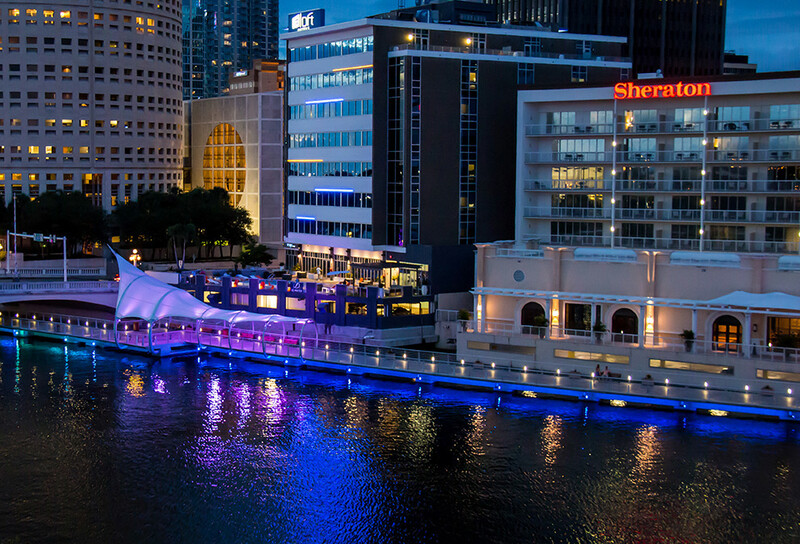 The approach to the design of the Riverwalk Plaza under the Kennedy Boulevard Bridge is a celebration of this major thoroughfare as a “gateway” to the urban core. The canopy frames, located north and south of the bridge, ascend in scale to announce this corridor as a threshold to the City. The client desired a fabric shade component to be incorporated into the project. The deck platform and structural components had already been designed and engineered. Typical fabric pole and framing systems would have required redesign of the platform decking. The form-giving components of the shade frames evolved from the need to utilize the strength of the centrally positioned deck pilings as well as our desire to keep the thin edge of the outer deck. 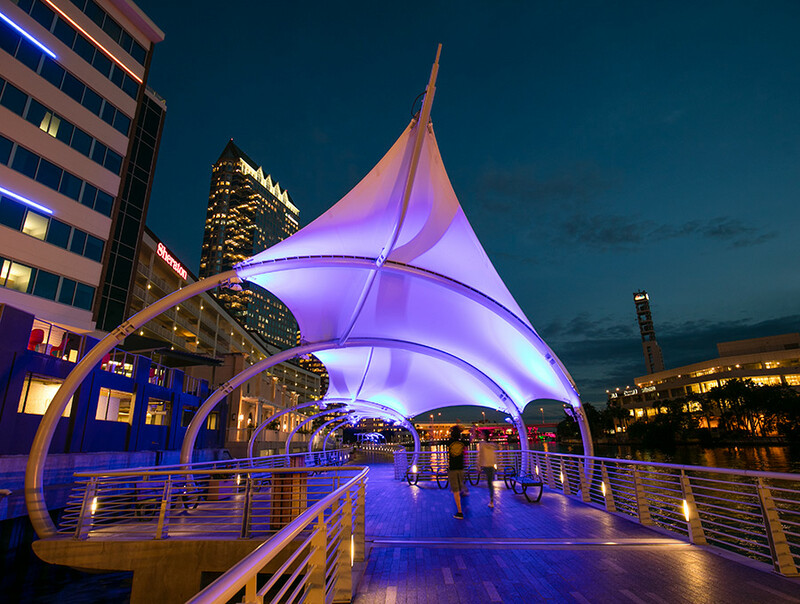 The resulting “hoop” geometry made for superior structural integrity to withstand the regional wind loading, while providing the greatest flexibility for canopy placement to maximize shade coverage. The elegant, yet simple forms proved to be an efficient and unique solution. 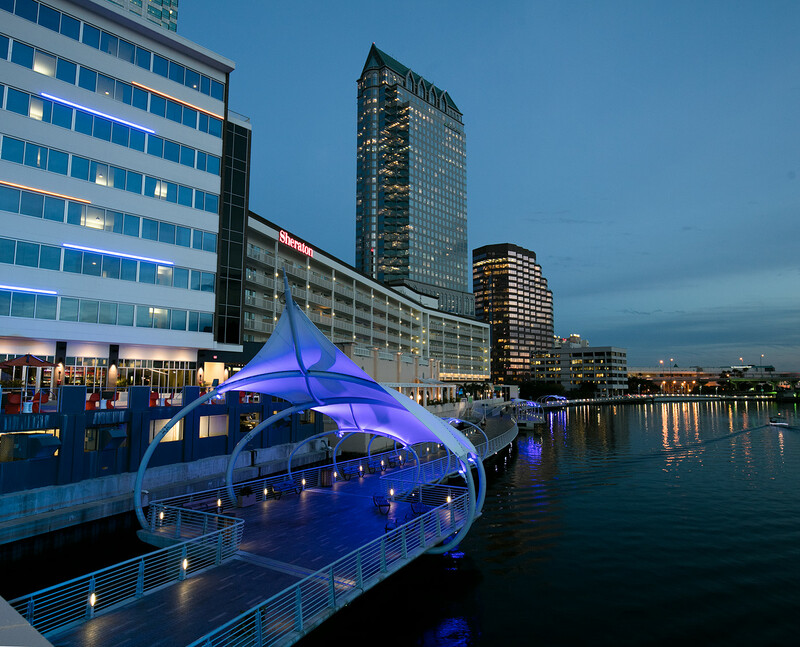 Creative lighting design and complimentary furnishings add to the pedestrian experience and give patrons an engaging and unique perspective of Tampa’s urban waterfront.